One gets the impression from Nee that the Bible was not nearly as important as Christians generally consider it. In his book The Ministry of God’s Word, Nee says, “Words alone cannot be considered God’s Word.” In this book, Nee becomes very philosophical, mystical and incoherent. He says that only as we deliver the Word in terms of the “reality behind it,” using what he calls “Holy Spirit memory” and “presenting the pictures as well as speaking the words” will the words be correct; otherwise they are not real. Then he arrives at a strange conclusion: “Nose in the Scripture stands for feeling. Smelling is a most delicate act, man’s feeling is most delicate.” Therefore, Nee says, a preacher in speaking needs to “mix feelings with the words spoken, else his words are dead. If our feeling lags behind, our words are stripped of the spirit.” To say as Nee does, on page 210, that the Holy Spirit only rides on feeling is dangerous. 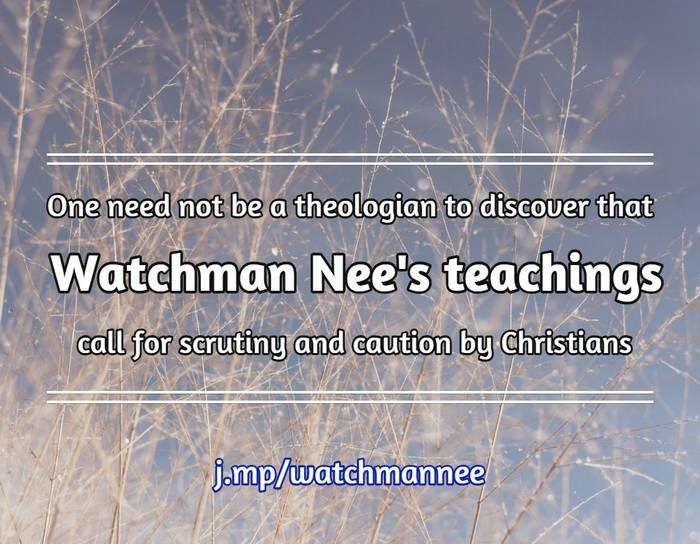 The book Understanding Watchman Nee, which this article refers to, is out of print. However, second-hand copies become available from time to time. This article was written by G. Richard Fisher, a member of the Board of Directors of Personal Freedom Outreach (PFO) — a ministry that educates Christians about the dangers and heretical doctrines of religious cults.